Most species of animal can go many days without eating. This is not true for cats, especially when they are sick. 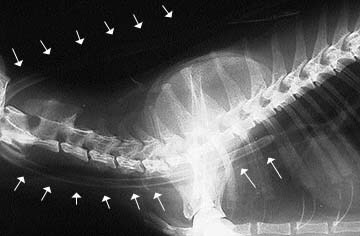 Several days of not eating (anorexia) can have serious consequences in cats and lead to failure of important organs like the liver. Internal organ diseases like liver disease hepatic lipidosis, infections, FeLV, and fevers, along with anatomical problems like a broken jaw can all prevent a cat from taking in adequate nutrition. In addition, all of these diseases increase caloric needs, so a lack of appetite in a diseased cat is an important problem to address. 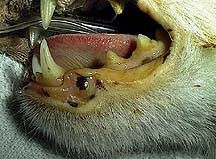 The yellow discoloration to this cats gums is called icterus, commonly know as jaundice. In this specific case the icterus is caused by liver disease because this cat has hepatic lipidosis. 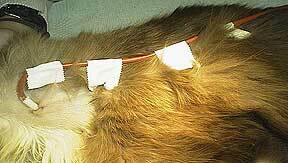 Feeding tubes are commonly used in these cats because they have stopped eating. Several options are available to give adequate nutrition to cats that are not eating. Many times they begin eating after we rehydrate them with intravenous fluids, especially if they have kidney disease. Sometimes we also need to assist feed them with special foods that are easy to administer and digest. Some cats will even start eating after we give them valium intravenously. Cats that have sugar diabetes (diabetes mellitus) might begin eating after we control their blood sugar level with insulin. Cats that are in pain from serious injury like a broken jaw might start eating when we give them pain medication. This liquid diet called Clinicare is often used to provide both fluid and nutrition on a short term basis. It can be given orally or through a tube. Another food used to provide short term nutrition is called A/D. A/D is also used for long term nutritional support in some cases. It can also be given orally by just putting it in your pets mouth. It can also be given through a tube when some water is added to it. A nasogastric tube is an option that sometimes works well for several days. This tube is passed through the nostrils and into the esophagus. It is taped and sutured in place. It has the advantage of easy placement and maintenance. The main problem is that the small diameter of the tube that is used only allows a liquid diet (CliniCare). To give an adequate amount of calories on a long term basis with this liquid diet would mean giving a volume of liquid that is far too much for the digestive system to handle, and the cat will usually vomit. nother medium term treatment option is tube feeding. In this technique we fill a syringe with A/D and attach a small rubber feeding tube to the end. We gently pass this tube into your pets esophagus and give it the full amount of food that is in the tube. It has the advantage of using a food source (A/D) that is more solid than a liquid diet (CliniCare), so your pet receives more of its needed calories. It also has the advantage of minimal discomfort since no tube is left in for long periods of time. Some cats will begin eating on their own after only 1 or 2 feedings with this techinque. A very effective solution to long term feeding is a PEG tube. PEG stands for Percutaneous EndoGastric. It consists of a tube that passes from the inside of the stomach, through the abdominal body wall to the outside. It allows the long term use of food that will give adequate nutrition. Its first disadvantage is difficult placement. It is usually put in with a special instrument like an endoscope, or is placed surgically during an exploratory surgery of the abdomen. Both methods require general anesthesia. In addition, a further disadvantage is the potential for infection in the abdomen at the site the tube passes out of the stomach. In this picture you can visualize the PEG tube that is exiting from the stomach after an exploratory surgery. In terms of ease of placement, cost, and effectiveness, one of the best options for long term feeding is an esophagotomy tube. It does not require specialized equipment or exploratory surgery, and can usually be placed with sedation only. Serious complications are rare, and usually consist of regurgitation of food if too much is given too rapidly, especially in the first few days of feeding. The esophagotomy tube passes from the left side of the neck into the far end of the esophagus. The tube is measured to ensure that the proper length is passed, and that the tube does not go into the stomach. This picture shows the measurement of the tube. 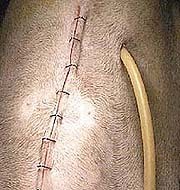 This is the appearance of the tube immediately after insertion and suturing to the skin. When it is bandaged only the tip where you will insert the food is visible. An x-ray reveals the path of the tube. The arrows on top outline the tube that is outside of the neck and under the bandage and along the back. The arrows on the bottom are the feeding tube as it passes inside the esophagus from left to right. As planned, it goes partway down the esophagus and does not enter the stomach. A food that is routinely fed through a feeding tube for long term maintenance is called A/D. We have a handout that gives you detailed information on this food. We will let you know how much to give and if we want any supplements added. You usually need to add a little water to it to so that it can flow through the feeding tube. If a PEG tube has been put in then the food you administer goes directly into the stomach. When food is given through the esophagotomy tube it partially fills the esophagus temporarily until it flows into the stomach. In both cases give the feeding mixture slowly and usually at room temperature or slightly warmed. You will be feeding several times per day throughout the day. After the feeding you need to flush the tube with a small amount of warm water. If it becomes clogged in spite of flushing, place a small amount of cola or papaya juice in the tube until it dissolves the clotted food. One of our nurses will give you detailed instruction in how to use one of these tubes before your pet leaves the hospital. If you have any difficulty with this tube we are here to help you, so please let us know if you need assistance after you return home. We would like to check your pet and the tube on a weekly basis until it is removed. The amount of time the feeding tube stays in varies from weeks to months. Only when your pet is eating well and putting on weight will we remove it. An added advanatage to the esophagotomy tube over the PEG tube is the ease of removal. On occasion the PEG tube can cause an intestinal blockage when removed because the tip of the tub remains in the stomach after removal and must pass through the intestines to be eliminated. The overwhelming majority of cats respond positively to long term tube feeding. If your pet consistently vomits then we will put it on some medication to minimize this usually temporary problem.